1 a: to make sound or whole. b: to restore to health. 2: to cause an undesireable condition to be overcome. 3: to restore to original purity or integrity. 1: the process of making or becoming sound or healthy again. 1: tending to heal; therapeutic. To heal: a return to wholeness or to a sound state. 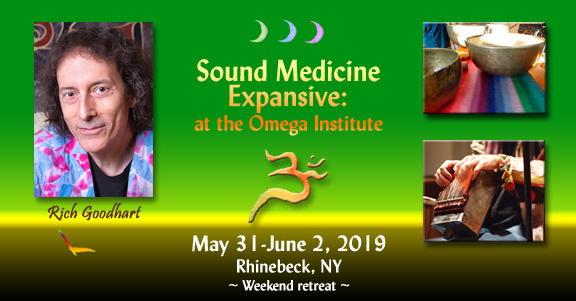 Sound Healing: using sound therapeutically to become 'sound' again! The Sound Healing Forum: a place to share and discuss ideas and information on the expansive world of Sound Healing, Sound Therapy, Shamanic Sound Medicine etc... whatever we wish to call it and whatever suits someone's practice the best - I don't care to get hung up on the names we give it. Personally, I feel all of these terms have their values and limitations, yet underlying them all is the intention of using sound, whether "musical" or otherwise, to encourage and support health and healing of mind, body, spirit, heart and emotions. The number one guideline and request for participation here is a dedication to integrity. If you are promoting baseless pseudo-mystical foolishness, whether a result of ignorance, misinformation, ridiculously poor "research" or willful fraud in order to sell products and services, you can expect to get called out on it. Having said that, mysticism, the magical and the intellectually elusive manifestations of this Great Mystery of existence as they relate to sound and healing are equally welcomed here for discussion and exploration along with the scientific and the methodically researched. So may it be integrity and our commitment to it that leads the discourse on the realms of healing practices, potentials and therapies with Sound - not the delusions, nonsense, misguidings, false information and even intentional misleading that passes itself off as 'knowledge' far to commonly these days on the internet. Selling our products and services is NOT the primary purpose of this forum, however there is a section for listing links to members websites and a section for listing events. Please do not post about your products, events or services in the primary forum section, thank you. This is great! Thank you for this! Glad, I returned to this page. Is there a place on this forum to post about products purchased, their quality, or lack thereof? I have an experience that I feel is important to share about a online bowl seller. We don't currently have any place specifically for that but you could just post about it in the Primary Sounding Circle section. Welcome to the Forum and thank you for asking first!